[by Dean Smith] While the Bible provides a first-hand account of the crucifixion of Christ, some have discredited the story as being little more than fabrication. However, the discovery of a crucified man in a tomb outside of Jerusalem in 1968 tossed cold water on these opinions. The discovery was made by Jewish archaeologist Vassilios Tzaferis. He found the bones of a crucified man in an ossuary or burial box in a tomb. After death, bodies were wrapped in cloth and laid out on shelves in the tomb. After decomposition, family members transferred the bones to an ossuary — small boxes (16 inches to 28 inches long). The name on this box was “Yehohanan son of Hagakol.” He was a 25 to 30-year-old man and based on the tomb contents from a wealthy family. The tomb was dated to the first century AD, sometime before 70 AD, which made Yehohanan a contemporary of Jesus. Because of the family’s wealth, they suspect the Romans crucified him for rebellious activities instead of criminal. It wasn’t until they discovered a seven-inch (17-18 cm) nail pounded through the man’s heel, that Tzaferis and his team realized what they had found. The nail was bent, but had a small residue of wood at the end. It appears while pounding in the nail, Yehohanan’s executioners hit a knot causing the nail to bend. This was the first and only body to date found of a known crucified person. The nail’s placement suggests the knees were bent and the legs and feet turned sideways. The Romans then pounded one nail through both heels securing the feet to the cross. There was also scratches in the bones on his arms suggesting the Romans pounded in nails just above his wrists. Nails in the hand, without additional support, would have torn through. This is just one example of crucifixion as there were a variety of methods used such as tying the arms to the beam using rope. 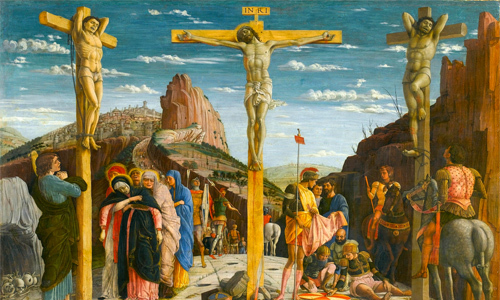 Crucifixion was initially used as a form of punishment or torture and not death. It was only later the Romans used it as a form of execution. Then they did it with a vengeance slaughtering thousands at a time including prisoners of war, rebels and criminals. People were left on crosses for days until they died. The Romans often provided a small piece of wood for the person to sit on or a support for the feet to prolong death. Without these, the person would quickly die from asphyxiation. While the Romans preferred a long drawn out death, for religious reasons Palestinian executioners would break the legs of Jews to hasten the killing. In Jesus’ case they planned to break His bones, but decided not to after finding Jesus was already dead (John 19:32-34). Just as importantly was Yehohanan’s proper burial. Some have argued that Jesus would have been thrown into a mass burial pit and not allowed His own private tomb. However, Yehohanan’s burial shows this clearly wasn’t always the case. Similar to Jesus’ tomb, this one had a large stone covering its entrance. The first paintings of Jesus’ crucifixion did not appear until early 600 AD as artists purposefully avoided depicting Jesus in this way. They traditionally have Jesus’ legs stretched out and a nail through the front of the feet as they would not have been aware of the Roman method of crucifixion.